Off Anzac Parade midway between Maroubra Junction and La Perouse and right on the ocean front at Little Bay, a site occupied for over 120 years as an hospital complex has been handsomely redeveloped. The Prince Henry Hospital Trained Nurses Association Inc. invites residents and visitors to inspect the Nursing and Medical Museum located in one of the beautifully restored 1914 Wards at Prince Henry at Little Bay. The Museum presents exhibits of early nursing and medical equipment including a fully functioning Iron Lung, a 1960s era heart by-pass machine and bounteous archival material and photos relating to the nurses and doctors of the Coast/Prince Henry Hospital from 1881 – 2003. A photographic display pays tribute to renowned cricketer Charles G. Macartney who was an employee of the Coast/Prince Henry Hospital. He held a record score of 345 runs in a single test innings. The former cricket oval, now a park, is named “Macartney Park at Prince Henry, Little Bay” in his honour. Of particular interest to genealogists is the collection of documents including cemetery records and a large map of the Coast Hospital Cemetery showing numbered grave sites. Among the items on display is a Randwick & District Historical Society publication that provides information on the cemetery including inscriptions on the headstones. Located in Brodie Street the Nursing and Medical Museum will only be open on Sundays from 10am to 4pm as from 1/5/2011. The Museum will only be opened by appointment and visits must be made by calling (02) 9387 4412. The Government and developers have worked to ensure that nineteen of the heritage buildings at the site now known as Prince Henry at Little Bay have been retained and refurbished for a variety of uses while accommodating a substantial mixed use residential community and significant open space. The entire site is open to residents and visitors. The open space, public buildings and the picturesque Little Bay Beach, with access stairs, continue to be enjoyed by all who wish to visit. 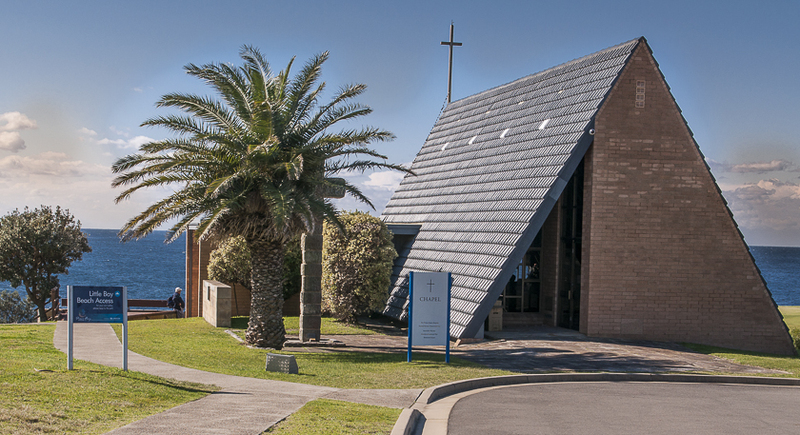 Another special feature of the site is the Nurses War Memorial Chapel with the ocean and the rocky foreshore of Little Bay forming an unforgettable backdrop to the stained glass window that forms the eastern wall of the Chapel. The Nurses War Memorial Chapel is only opened by appointment made with the Chapel Booking Officer at phhtnachapelbookings@gmail.com or on 0447 614 137. It is a beautiful venue for weddings and baptisms and also a fitting location for funeral services.